Nurses are important members of the health care team and their primary role is providing patient care. Dedicated and competent nurses are the need of the hour with health care occupying the main stage in today's world. Since its inception in 2005, the Fernandez School of Nursing is committed to providing comprehensive nursing education and clinical skills. We believe that our nurses will be a class apart and totally committed to their profession. Situated in Bandlaguda, the school is affiliated to the Indian Nursing Council and has two courses focusing on nursing in the field of obstetrics/gynaecology and neonatology. 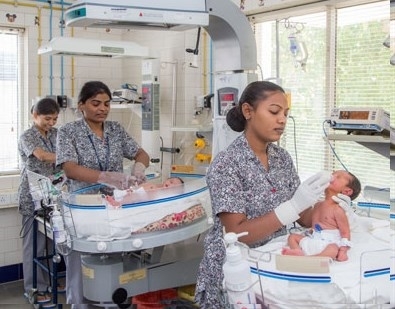 In addition to the nursing training, the school also runs a course on midwifery. Students are required, on successfully completing their training, to render their services to the institution for a stipulated period of time. We, at Fernandez Hospital, believe that the standards we set, the techniques we follow, the experience of our faculty, the clinical hands-on practicals coupled with the academic knowledge that is imparted, provide an atmosphere that is conducive to learning and developing oneself. This is turn enables our nursing school interns to emerge as a new generation of confident and truly skilled nurses on par with their international counterparts.